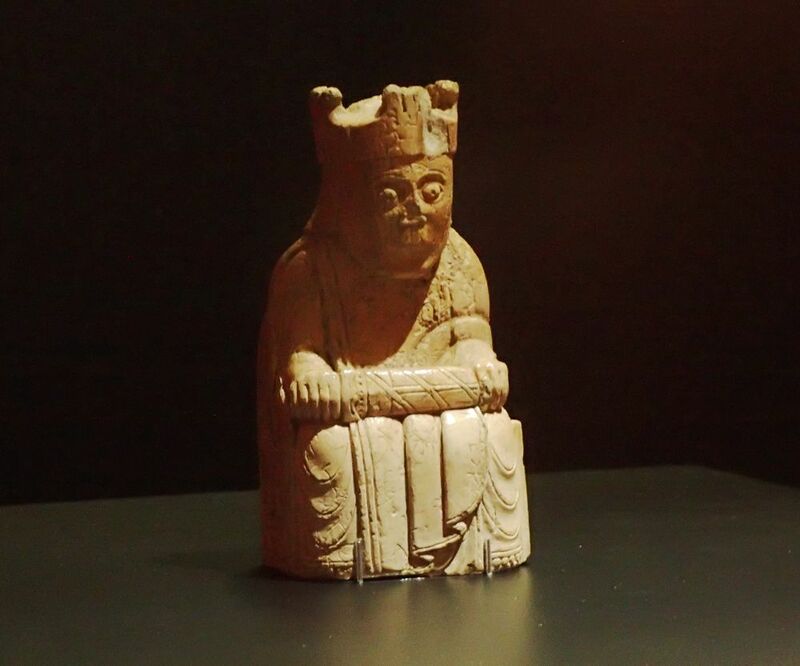 I’m a big fan of the game of chess, which is why I was thrilled to find this 800-year-old chess piece – a chunky king with a sword across his lap and a bug-eyed expression on his face – on display at the Canadian Museum of History. Standing 10 centimetres (about 4 inches) tall and oozing character from every pore of his elaborately carved walrus ivory body, this king is one of 93 chess pieces collectively known as the Lewis chessmen. The chessmen were found stashed in a beach cave on the Scottish Isle of Lewis in 1831. They have since become something of a global sensation, immensely popular with visitors to the museums lucky enough to display them. Just where did these charismatic chessmen come from? And what makes them so spectacular? Their story unfolds below. The Lewis chessmen were found buried on a beach near Uig (Aird Uig), on the northwest coast of the Isle of Lewis, in the Outer Hebrides of Scotland. They were discovered sometime before April 11, 1831, the date on which they were exhibited by a trader at the Society of Antiquaries in Edinburgh. As to where the chessmen originated – and how they ended up stashed in the Scottish sand – no one really knows, although two main theories prevail. The first theory – held by many scholars and historians, including those at the British Museum, where the majority of the chessmen reside – is that the pieces were crafted in Tronheim, Norway. The style of their carving matches that of other carved items unearthed in and around Tronheim, and the designs of the armour, shields and thrones incorporated into several pieces match those of actual 12th century items uncovered in Norway. Twelfth-century Trondheim was also home to a number of highly skilled craftspeople, who had the support and encouragement of a wealthy population able to afford such luxuries as ivory chess sets. 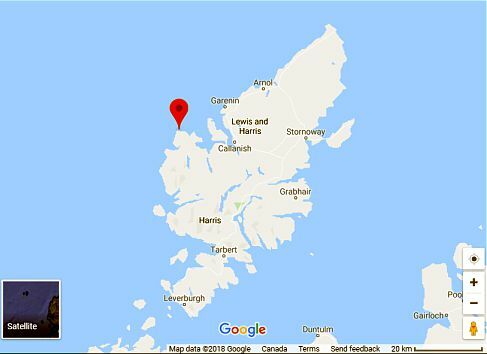 In the chessmen’s day, the Isle of Lewis was part of the Kingdom of Norway, not Scotland – so that beach near Uig was actually in Norwegian territory. Scholars believe that the pieces may have been cached there for safekeeping by a Norwegian merchant who planned to transport them to markets in Ireland. 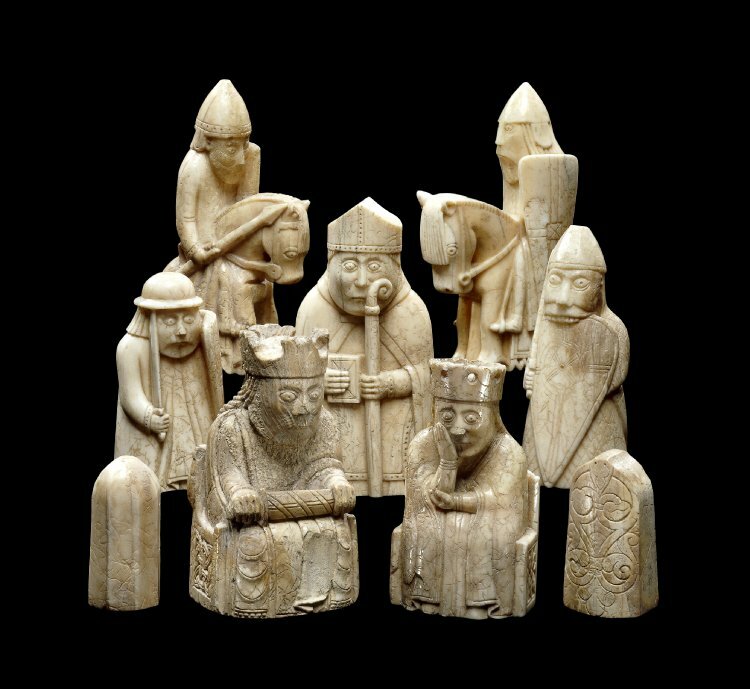 The second theory – recently bolstered by Nancy Marie Brown in her 2015 book Ivory Vikings: The Mystery of the Most Famous Chessmen in the World and the Woman Who Made Them – posits that the chessmen were crafted in Iceland by one Margret the Adroit, a highly skilled carver of ivory who lived in the cultural and political centre of Skálholt. Margret, the wife of a high-ranking priest, was often commissioned by Skálholt’s bishop, Bishop Páll Jónsson, to carve elaborate ivory objects as gifts for his friends overseas. 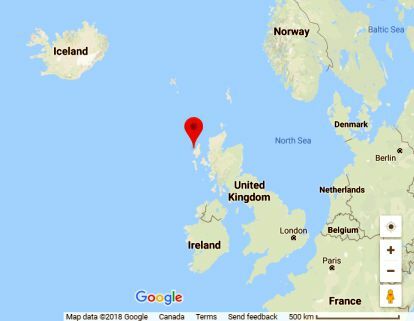 The pieces ended up buried in the sand near Uig, says Brown, because that part of the Kingdom of Norway was then an important trade hub, and Iceland played an active role in the Viking luxury trade of the time. Other aspects of the chess pieces support the Icelandic argument. The knights ride small, pony-sized horses like those found in Iceland. And the collection introduces the “bishop” – a term unique to Iceland during the chessmen’s time – as a playing piece for the first time in the game’s known history. Whatever their origins, the Lewis chessmen are a big hit with pretty much anyone who sees them. Folks cite their unique, almost comical expressions as part of their charm. No two are exactly alike, and each is bursting with personality. Let’s take a look at each type of piece in turn. The Lewis set consists of 93 pieces: 8 kings, 8 queens, 16 bishops, 15 knights, 12 warders (rooks) and 19 pawns – plus 14 tablemen (uncarved playing discs) and a buckle that may have been used to secure a bag. The majority of the pieces are carved of walrus ivory, with a few fashioned from whales’ teeth. The chessmen range in height from 6 centimetres (2.4 inches) to 10 centimetres (3.9 inches). The taller the piece, and the more elaborate its garments and styling, the higher its status in the game. Each piece has its own unique character, clearly conveyed in its expression and detailing. No two are exactly alike, although the pieces do share some common characteristics. The 8 kings are crowned, bearded and sit clutching swords across their laps. All lean their heads forward intently, eyes riveted on the action before them as they seemingly plot their next moves in battle. Each grasps his sword with both hands, as if ready to draw the blade at any moment. The kings wear richly decorated clothing, and the backs of their thrones are carved with intricate designs of flora and fauna. These pieces are the tallest of the set, as befitting their rank. The 8 queens, crowned and regally attired, sit holding their right hands to their right cheeks, as if resting their heads in their hands. Some people believe the queens are contemplating — with shock or sorrow — the destruction of war, but it’s also possible that these royal ladies are just plain bored: at the time they were carved, the queen was the weakest piece in the game, able to move only one square diagonally at a time. The queen did not assume her more powerful role on the board until the late 15th century. The 16 bishops are robed, wear mitre caps and hold croziers (curved religious staffs). Some sit, some stand, some hold a book, others have a hand raised in blessing. 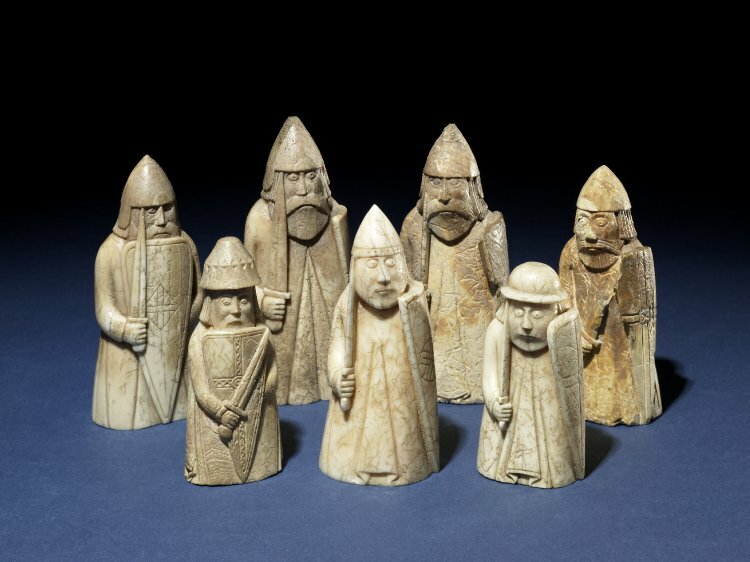 As mentioned earlier, the Lewis chessmen are the oldest existing chess set to clearly include the bishop as a playing piece, and the particular style of the Lewis bishops’ mitre caps was used to help date the set. Before the bishop appeared on the chess board, his position was occupied by the “elephant,” an animal-themed piece that could jump only two diagonal squares at a time. The 15 knights, helmeted, battle-ready and clasping shields and spears, perch atop tiny, toy-like horses. The contrast may seem comical, but Icelandic horses have in fact always been pony-sized, and it was not unusual for Nordic riders’ feet to hang well below the bellies of their small but strong steeds. Some scholars suggest that, because the pieces were sized according to rank – and because the knights had to stand shorter than the bishops and taller than the warders – the horses simply got the short end of the stick height-wise. The 12 warders, or standing foot soldiers, take the place of rooks or castles in today’s chess sets. The Lewis warders vary widely in appearance. Each holds a sword and shield in a unique position. Some wear pointed helmets, others wear rounded ones. Some appear to hunker behind their shields, others stand tall and proud. One peers warily to the side. The most unique among this group are the four “Berserkers” – legendary, wild-eyed Norse warriors who bit their shields in a trance-like frenzy and fought, armourless, like enraged beasts on the battlefield. The 19 pawns, the smallest pieces of the set, are simple carved obelisks standing at least 6 centimetres (2.4 inches) tall. The pawns closely resemble the playing pieces of older Islamic chess sets, which used abstract shapes that did not display human or animal features of any kind. Several pieces show remnants of a red stain, suggesting that early chess sets were red and white, not black and white. A skilled carver could create up to four chess pieces from a single walrus tusk. The chessmen have made the leap into popular culture. They appeared in the first Harry Potter movie, in the Disney-Pixar movie Brave and on the cover of Agatha Christie’s novel The Big Four. In 2016, Scottish artists built a 2-metre (6.5-foot) model of a Lewis Berserker from 90,000 Lego bricks. The pieces were acquired by the British Museum in late 1831 and early 1832 – about eight months after they were first exhibited at the Society of Antiquaries in Edinburg. The chessmen are among the first Medieval artifacts in the British Museum’s collection. The chessmen are an early example of a “figurative” chess set – one that features human-shaped pieces. Older “abstract” sets – which had basic shapes as pieces – came to Europe around 1000 AD by way of the Islamic world. The Lewis set, with its pieces based on the social roles, ranks and attire of the time, helped adapt chess to a European context. Eighty two of the Lewis Chessmen (including the 14 tablemen and one buckle) are owned by the British Museum. Most of these pieces are on display in Room 40, the Sir Paul and Lady Ruddock Gallery: Medieval Europe 1050-1500, on the upper level. Eleven Lewis chessmen are owned by the National Museum of Scotland. They are on display in the Kingdom of the Scots exhibit on Level One. Six Lewis chessmen are on display at the Museum nan Eilean (Lews Castle) in Stornoway on the Isle of Lewis. They are on long-term loan from the British Museum. 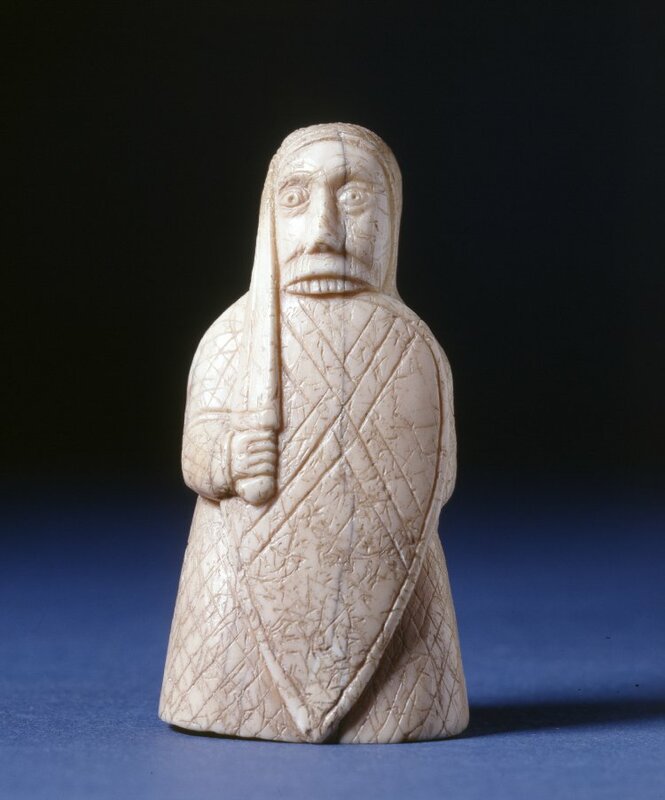 The British Museum regularly lends Lewis chessmen for exhibitions in museums around the world. The lone king that captivated me at the Canadian Museum of History in Ottawa, Ontario, is part of a special exhibit called “Medieval Europe – Power and Splendour,” which runs until January 20, 2019. If you can’t travel to any of the above locations, check out these virtual 3D models of select Lewis chessmen, provided by the British Museum, or visit the British Museum’s online collection holdings for “Lewis chessmen”. The British Museum. “The Lewis Chessmen.” Retrieved 2 October 2018. The British Museum. “Check it out! A closer look at the Lewis chessmen.” 7 March 2017. Retrieved 2 October 2018. The British Museum on Sketchfab. “Lewis Chessmen.” Retrieved 2 October 2018. Brown, Nancy Marie. Ivory Vikings: The Mystery of the Most Famous Chessmen in the World and the Woman Who Made Them. Martin’s Press, 2015. Brown, Nancy Marie. “The Lewis Chessmen and Popular Culture.” God of Wednesday, 4 November 2015. Retrieved 2 October 2018. Cazaux, Jean-Louis, and Rick Knowlton. A World of Chess: Its Development and Variations Through Centuries and Civilizations. McFarland Publishing, 2017. Earliest European Chessmen. Retrieved 2 October 2018. The Isle of Lewis Chessmen. Retreived 2 October 2018. Klein, Christopher. “The Enduring Mystery of the Lewis Chessmen.” HISTORY, 25 Feb 2016. Retrieved 2 October 2018. National Museums Scotland. “Lewis Chessmen.” Retrieved 2 October 2018. Pinkowski, Jen. “12 Berserk Facts About the Lewis Chessmen.” Mental Floss, 2 November 2015. Retrieved 2 October 2018. Wikipedia, “Lewis chessmen.” Retrieved 3 October 2018. Connaught Hill Park – Did you know?